Advancells, a Noida based Stem Cell research and technology company has been awarded the Medical Research CEO of the Year 2017 – India & Best Stem Cell Technology R&D Company – India awards at London based annual Global CEO Excellence Awards 2017. 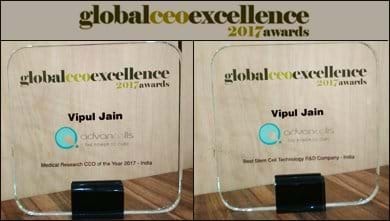 Proud to announce that Advancells: Stem Cell Therapies bagged two awards in the coveted Global CEO Excellence Awards for the year 2017. Advancells was recognised as the “Best Stem Cell Technology R&D company” and our CEO Mr Vipul Jain was adjudged the “Medical Research CEO of the year 2017”. We pledge to continue making a difference in the lives of patients around the world with our cutting-edge stem cell therapy solutions for various lifestyle and life-threatening diseases. Advancells is a pioneer in regenerative medicine in India and is focused on creating treatment protocols centered around the almost limitless potential of Adult stem cells in treating a variety of lifestyle and life-threatening diseases. Advancells operate a cGMP compliant lab which is at the forefront of technical innovations and creating different cell lines that can be used by clinicians in providing treatments to the patients. UK based Global CEO Excellence Awards recognizes global leaders from around the world each year who have been leading their companies in bringing meaningful changes to businesses across sectors. The awards recognize disruptive technologies in various fields who have the potential to change the world order in the near future.